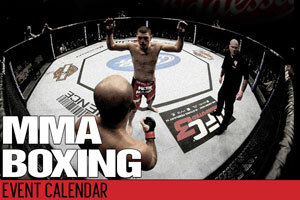 MMA Event Calendar - Find MMA Fights for UFC, Bellator, WSOF, Invicta plus boxing with the events listed on oddessa.com. The popularity of MMA betting has forced an explosion of promotions and events around the world, and Oddessa.com has its finger on the pulse of the industry with its MMA Event Calendar. You don’t need to go bouncing from website to website to map out the Mixed Martial Arts landscape. You can find all the major cards in one spot thanks to renowned MMA oddsmaker Joey Oddessa. Our event page is packed with upcoming action so that you don’t miss an opportunity to cash in on all the MMA betting available. Each event can be expanded with one click, showing the full card, preliminary bouts and important times and dates. Keep tabs on all the biggest and best in Mixed Martial Arts with Oddessa.com.